Most of us will never drive a Mercedes-Benz M Class, and that’s probably just as well because we’d all just be spoiled. There’s not much to put a person off, unless it’s the price. But even there you have some choices to make that might allow a few more of us to afford one. 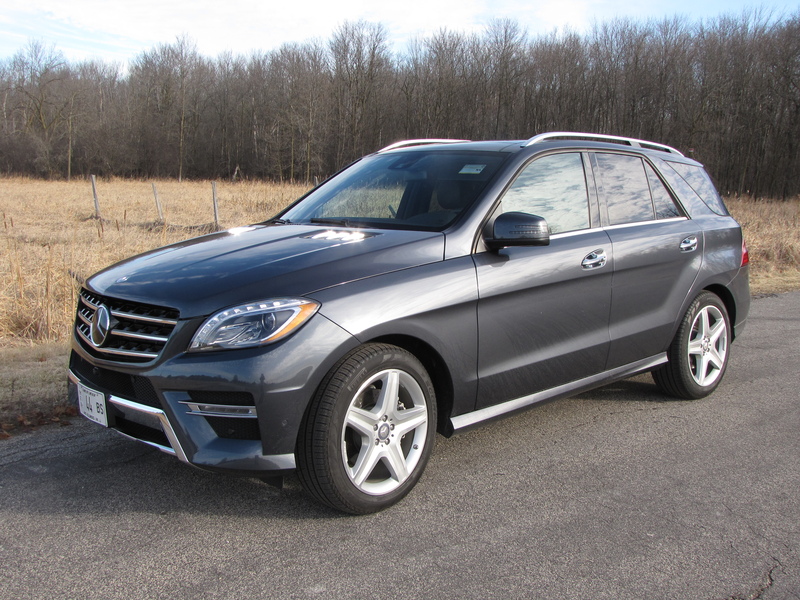 I drove a “steel gray” ML400 4Matic, the bi-turbo V6-powered unit that is one step away from the ultimate luxury mid-size sport-utility truck from Mercedes. It listed at $62,900, but ladled on 16 options that pushed it to $79,310. Don’t let that price scare you off completely though. While this had all-wheel-drive and that powerful 329-horse V6, a lesser buyer could sneak into an ML350 with just rear-wheel drive and a 3.5-liter V6 that cranks 302 horsepower along with a torque rating of 273. The ML350 starts at $49,225, including delivery. For those who prefer the slightly better mileage a diesel offers, Mercedes even has a BlueTEC model with 2.1-liter 4-cylinder diesel for $50,725. It delivers 200 horses, but a whopping 369 lb.-ft. of torque. All this is to say that luxury has its price, but you do have copious options from power down to goodies to coddle you and your favorite passengers. Let’s start with the ride, because that’s where you’ll notice a difference between this, and say a BMW X5 or other sporty sport-ute. Ride here is smooth and controlled and quiet. 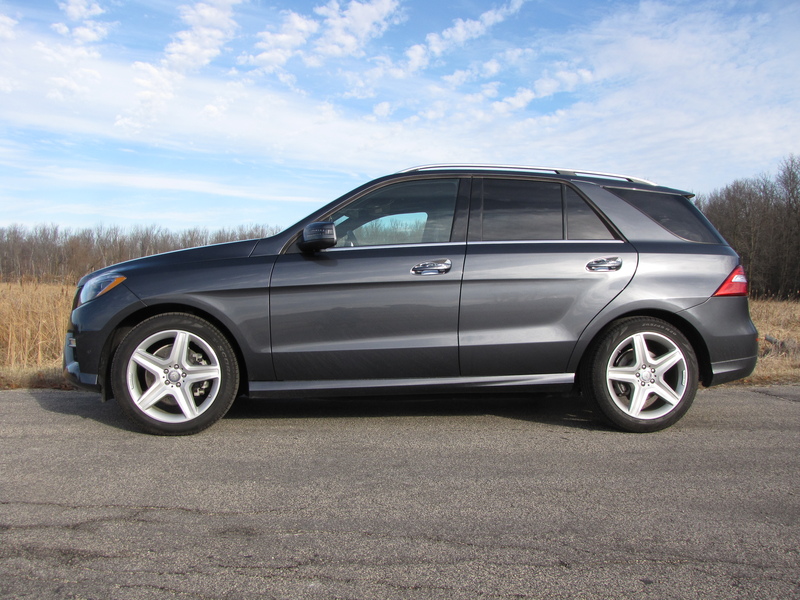 The Benz’s Airmatic adjustable air suspension system ($1,610) allows you to dial in Comfort or Sport modes. Some systems offer more choices, but you’ll likely only care for two anyway. Comfort delivers exactly that, comfort. The ride is cushioned and controlled with excellent damping that eats up Wisconsin’s horrid winter-wracked roadways. Sport, naturally firms things up, but you’ll likely not want to use it unless you travel to better climates where blacktop roads are smoother that anything the Midwest has to offer. Power is solid and certainly provides enough grunt to get this 4,850-lb. truck up to highway speeds, even when loaded with passengers. Five folks fit comfortably by the way, and this ute will pull 7,200 lbs. of trailer and boat. Big disc brakes with anti-lock and stability control keep the vehicle under control and stop it quickly. The all-wheel-drive system also gives it excellent traction in sloppy weather. I had it during a wet spell and never spun a wheel even under heavy acceleration. Note that this has the same underpinnings as Jeep’s Grand Cherokee, as the two vehicles were developed together when Chrysler was part of Mercedes. Handling is fine too, although wind can buffet the ML, as it does all big boxy utes, pushing it around on the highway. Under normal conditions it corners well, but the one knock you’ll hear on the ML is that steering feedback is muted delivering moderate road feel. But steering effort is modest and smooth, erring on the luxury side, which is in character for this ute. Inside, the ML wraps you in luxury and a cockpit that is as quiet as you’d expect at this price. Luxury defines the interior here, with open pore Ash dash trim. The test ute’s interior was stunning with black leather dash top, but dark brown open pore ash trim (just $160) on the dash and doors. Perforated leather seats were dark brown to match the wood and the same leather covered the door inserts and armrests. Matte metal trim surrounds the center stack’s controls, steering wheel hub and all buttons and knobs feature the same look. Classy! Mercedes’ seats are well shaped offering good support all around, plus the test ute included heating and ventilation ($570) for the front seats and heated rear seats ($620). Best of all, and everyone who rode in the ML was wowed by this, the front seats offer a four-setting massaging feature ($1,100), which like many features is adjusted through a knob on the console. Takes a while to master that, but it’s worth the effort. Ostensibly massaging seats are meant to keep a driver alert on a long drive, but passenger’s love this feature too. While it feels good, it also gets the blood flowing to keep you awake. The dash is well laid out with real analog speedometer, tachometer, gas and temperature gauges. Between them is a digital readout for the time/temp and trip computer functions, which are operated via a pad on the steering wheel hub. All are easy to see and use. Dash and center stack controls are easy to reach, understand and adjust. The wheel is heated too! That wheel is a power tilt/telescope unit and the driver gets a three-memory seat, with buttons on the door. All power seat controls also are up on the door and easy to get at and use. The steering wheel also is heated ($250), but that is controlled on the power tilt/telescope lever hidden behind the wheel. You must rotate the lever’s end away from you to engage the heated wheel. This control along with the wiper lever and cruise control lever are behind the wheel, with the cruise control impossible to see. That can be a bit confusing at first. I also found myself hitting the gear shift lever, which is off the column to the wheel’s right, thinking it was the wiper stalk occasionally. I’m sure a driver would remember this after some time, but initially it can cause confusion. A noisy chime is another annoyance I’d want turned off if I were to purchase an ML. The chime occurs every time you turn off the ignition and open a door. It warns you, both via the chime and a dash message, to “take your key” with you. Highly unnecessary, but no doubt a “legal” concern. Thanks lawyers! There’s a lot more to like here than to fuss about though. Overhead is a panoramic dual-panel sunroof ($1,090), the front half of which powers open. Mercedes wisely equips the roof with a thick enough power cover inside to block serious sun from heating the interior or allowing sun to seep through and blind the driver. 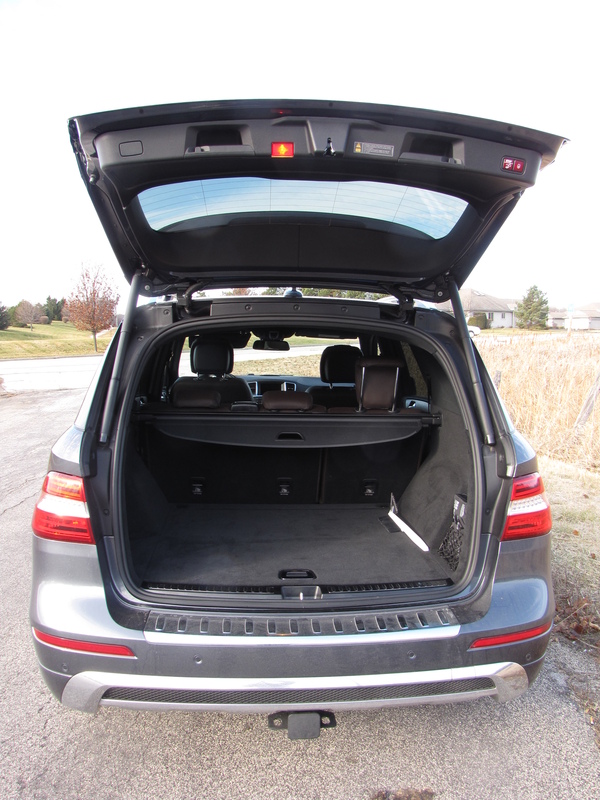 In back are split rear seats and a big cargo area under a power hatch. So the ML is easy to load and will carry a lot of gear, even with five passengers comfortably in the two rows of seats. There are the expected electronic wonders too, like blind-spot warning and lane departure technology ($1,950) that only slightly vibrates the steering wheel if you wander near a lane marker. Another package ($1,290) includes park assist and a surround view camera to aid in tight parking spots. Roomy describes the cargo area, and the hatch is powered. Finally, there’s the matter of gas mileage. At the moment, with gas prices on the wane, this may not seem as vital as in months past. But the ML400 is rated at a modest 18 mpg city and 22 mpg highway by the EPA. This is better than the previous model that featured a V8 for power. I got just 19.6 mpg in about an even mix of city and highway driving and premium fuel is suggested. If you need the additional power (518 horses) from the V8 in the AMG edition, you’ll sacrifice even more gas mileage. But you will have a top speed of 174 mph, in case you need to go that fast over Wisconsin’s moonscape roads. Your call, but the ML is a delight in the tested iteration and can be had for around $50 grand if you don’t need all the luxury, or AWD, that this one offers. Hits: Excellent ride and brakes, good power and all-wheel-drive. High-end luxury look, feel and super quiet interior. Heated front and rear seats, heated power tilt/telescope steering wheel, panoramic sunroof, power hatch, adjustable suspension, wood trim, well-shaped massaging seats. Misses: Price and some controls hidden behind steering wheel, plus annoying “take key” chime every time you exit the ute.